For people who might wonder why the Fed would want higher inflation, the answer is that price inflation reduces real wages, which should encourage employers to hire more and reduce unemployment. Inflation also is supposed to discourage savings and make people give up their long term goals and just spend like drunken sailors. Once, while a good friend was visiting me on a particularly cold winter's night, the temperature in the poorly insulated living room of my old Victorian house dropped to a distinctly chilly 62 degrees. "Can't you make it any warmer?" she asked? "I'm afraid I can't," I said; "the thermostat's already on 68." "Try setting it at 80," she replied. I didn't indulge her (well, not that way). But I wonder whether those economists who have been calling for a higher inflation target would have. You raised a good question: if the Fed really wants 2 percent inflation, why aren't they achieving it? After all, central banks traditionally could deliver any long-run rate of inflation they wanted as long as they had the will to do so. But I think that George and Jerry are right; 2 percent is their actual goal. So what explains the failure of technique? My answer would be Fed targeting of interest rates, yet again. As long as interest rates are really low (for reasons other than monetary policy), they think their policy is very loose and just not yet working. Couple that with the fact that paying interest on reserves and other policies designed to allocate credit are offsetting their expansion of the monetary base. Everyone assumes that the Fed can create as much inflation as it wants when it wants. Since it hasn't, some think it's being coy, while others think it's slacking off. Real economists should consider the facts and quit trying to be psychics. 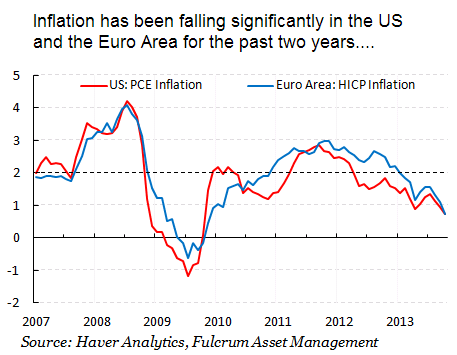 The fact is the Fed is trying to generate higher inflation but can't. Monetary policy is not as powerful as mainstream econ assumes. The Fed has two tools to generate inflation - low interest rates and QE. For QE to create inflation, the sellers of bonds to the Fed must spend the money on consumption. If they just buy another asset they thwart the Fed's efforts. If the Fed buys from a bank, the bank must lend the money to a consumer or a business. Currently, banks aren't interested in lending for anything but housing and cars, and then only to borrowers with perfect credit. The Fed is hindering banks with excessive oversight on new loans. Remember that many journalists blame lazy regulators for the latest financial disaster. So regulators are being over zealous in preventing loans that emit the odor of risk. For low interest rates to work, businesses need to borrow and invest, but they aren't because they see no good opportunities. Banks have little interest in making any but the most secure loans because low interest rates skew the risk/reward calculations: the rewards for all but the largest and safest loans don't amount to the risks involved. At other times the government has done the borrowing and spending to create inflation, but the US has tapped out its credit line because of its high debt level. Most inflation has resulted from government borrowing and spending. One would think economists would have learned more from Japan's failed attempts at goosing the money supply over the past two decades. Mainstream econ fails to understand why the Fed fails because it sees the economy as a hydraulic system - pull the interest rate or QE levers and the economy responds like a Bulldozer. However, there is nothing hydraulic about the economy. Economics deals with human beings who decide how to respond to Fed lever pulling. The past four years people haven't felt like responding. So why do people get the idea that the Fed can create inflation when it wants? The do so because they run a few regressions with Fed policy and interest rates and find a correlation. What they don't see is that Fed policy is virtually impotent in recessions and the early part of the recovery. It becomes more effective during the later stages of the recovery until that policy causes another recession.